There are many sightseeing spot in Minamifurano town. You can see different scenary with the season. Lake Kanayama is artificial lake and it has a large area. It surrounded with a virgin forest. In summer, you can enjoy canoeing, camping and seeing many lavender flowers. In winter, you can enjoy smelt fishing! If you come from Furano area to Minamifurano using R38, you can see Roadside station “Minamifurano” at left side. There is a large glass tank and visionary fish “Japanese Fucho(Itou)” in it. Japanese fucho belongs to Salmonidae, in Japan it decrease by destruction and division of a habitat, the artificial import of a living thing, environmental pollution and hunting. In Minamifurano many Japanese Fucho live and it increase every year by biological research, setting an area closed to fishing and a closed season of Lake Kanayama or Sorach river. There are also displayed stuffing bears. Minamifurano town is surrounded great nature, so many wild animals live. There are many tree stumps that grow at Minamifurano town. Therea are many Minamifurano souvenirs, e.g. Potato with butter “Batajaga”, Japanese tea that is made of bamboo “Kumasasa cha”, corns, cookies and Furano area souvenirs. At Second floor, there is plug and free wifi service. Poppoya was written by Jiro Asada, and filmed on 1999. Ikutara station was used as Horomai station that was in the key of the story. *Leading actor of this movie, Ken TAKAKURA died on November 10th. We pray that his soul may rest in peace. 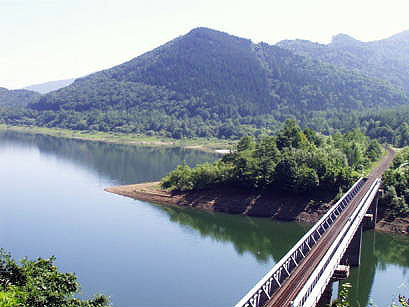 Karikachi Pass is on the border of Shintoku town and Minamifurano town. It’s 644m height. It overlooked Tokachi plains when whether is clear. It was built in 1967. It is released the internal of the dam only the Lake Kanayama festival on July. This hall proximate office of Kanayama dam. There is a room where Kanayama dam historical things are displayed. In Minamifurano, a wide range of summer and winter sports are available due to the abundant nature. It is located south of lake Kanayama. It takes 15min. from Ikutora station. The snow is nowise inferior to famous ski resort near Minamifurano. It is no limitation to use snowboard. ※31th Dec. and 1th Jan. is closed. ※Please bring the photo(3.5cm×3.5cm),when you buy season pass. It is located Kitaochiai area and it is surrounded by greatful nature. In summer, you can enjoy rafting at sisorapuchi river and In winter, enjoy dog sled. It is located Ochiai area. In summer, you can enjoy hiking and canoeing. In winter, you can enjoy snowshoes and curling. It is located Ochiai area. 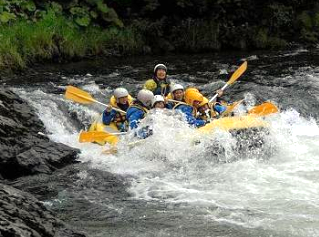 In summer, you can enjoy rafting and canyoning. In winter, you can enjoy smelt fishing. There are many kind of restaurant in Minamifurano. Venison curry, buckwheat noodles, sauteed pork, pizza, bageles, etc. 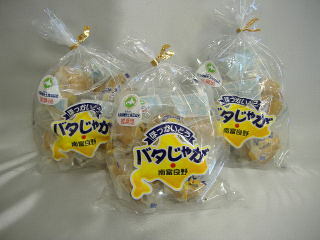 Potatos produced in Furano and butter produced in Hokkaido is used. It is delicious and easy to cook. A kind of bamboo “Kuma sasa” is resistant to cold weather as Minamifurano minus 25degrees environment. It is said that kumasasa cha will strengthen the natural human healing power. This hotel surrounded many trees and it makes you gentle feelings. It is made of Japanese larch trees, origin of the hotel name “larch”. It is also popular with the dinner. 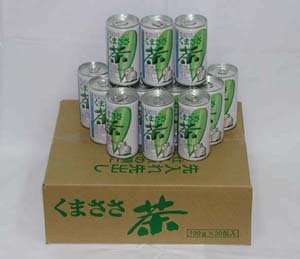 Many principal products of this district is used. This resort house has large public bath. 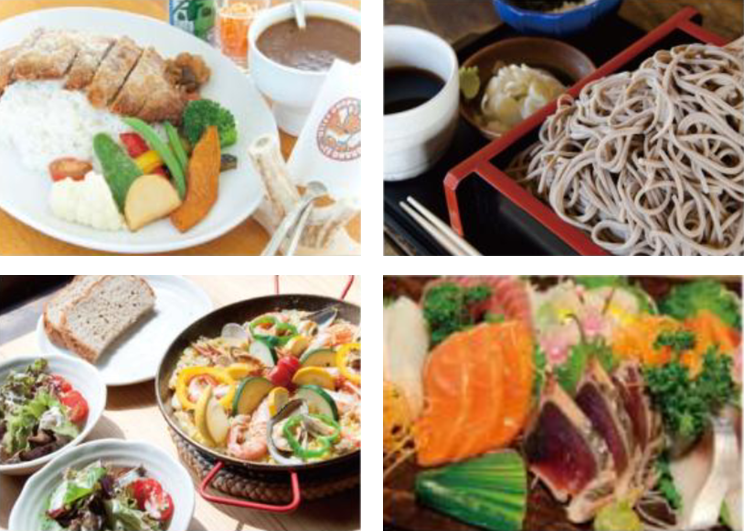 At restaurant, you can enjoy many seasonal food in Minamifurano.There are two large rooms, one is 50 person can use, and another is 38 person can use, so it also suitable as a training institute. There are Barbecue house and bungalows, so you can enjoy outdoor easily. This B&B is very homely, so some people stay here many times. It is near Ikutora station and Minamifurano ski area. It is famous for edible wild plant dinner. You can drink coffee anytime(self-service). Namputei is the newest B&B in Minamifurano. It’s old folk house-turned, so the guest will feel cozy. with dinner and breakfast included. ※Prior booking is required and please show your passport to front desk when you check-in. ※This site only inform accommodations in Minamifurano so we can’t involved any troubles. ※At winter it takes more time because of snow. A. New chitose airport Sta.→Minamichitose Sta.→Shintoku Sta.→Ikutora Sta. B. New chitose airport Sta.→Sapporo Sta.→Takikawa Sta.→Ikutora Sta. Copyright(C) Town MINAMIFURANO All Rights Reserved.